In conventional parlance, vanity is the excessive belief in one's own abilities or attractiveness to others (Stephen LaMarche). Prior to the 14th century it did not have such narcissistic undertones, and merely meant futility. although glory is now seen as having an exclusively positive meaning, the Latin term gloria (from which it derives) roughly means boasting, and was often used as a negative criticism. In Orthodox church, vanity is one of eight sinful and diabolical passions, the fight against which is a major task of every Orthodox Christian. Often we find an inscription on a scroll that reads Omnia Vanitas ("All is Vanity"), a quote from the Latin translation of the Book of Ecclesiastes. Although that phrase, itself depicted in a type of still life, vanitas, originally referred not to obsession with one's appearance, but to the ultimate fruitlessness of humankind's efforts in this world, the phrase summarizes the complete preoccupation of the subject of the picture. In a detail of of the The Seven Deadly Sins and the Four Last Things (1485), Hieronymus Bosch depicts a bourgeois woman admiring herself in a mirror held up by a devil. Behind her is an open jewelry box. A painting attributed to Nicolas Tournier, which hangs in the Ashmolean Museum, is An Allegory of Justice and Vanity. A young woman holds a balance, symbolizing justice; she does not look at the mirror or the skull on the table before her. Vermeer's famous painting Girl with a Pearl Earring is sometimes believed to depict the sin of vanity, as the young girl has adorned herself before a glass without further positive allegorical attributes. 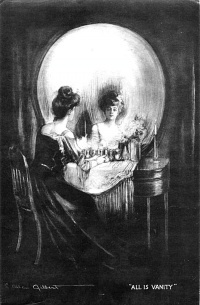 Vanity is also one of the many factors used to evaluate mental health and social skills, as also an important indicative of bipolar disorder. Unless indicated otherwise, the text in this article is either based on Wikipedia article "Vanity" or another language Wikipedia page thereof used under the terms of the GNU Free Documentation License; or on original research by Jahsonic and friends. See Art and Popular Culture's copyright notice. This page was last modified 19:46, 12 September 2012.